I am writing on behalf of Clean Air in London (CAL) to respond to the consultation on your action plan to battle London’s toxic air. Thank you for the opportunity to do so. As you know, CAL scored the Mayoral candidates before the recent election on five themes covering the most important actions the Mayor should take to reduce air pollution that are entirely within his powers. These themes are still applicable today so we have organised our response along those lines. Our scoring offers eight points for measures pledged and two bonus points if you will implement all of them and our full clean air manifesto. CAL’s scoring in this submission is ‘generous’ because it gives full points for a ‘charge’ not a ‘ban’. You will see that CAL is very concerned that you are proposing to charge not ban diesel vehicles and may not make the so-called ultra low emission zone (ULEZ) bigger until September 2020. CAL congratulates you for making air quality one of your top four priorities for this Mayoralty alongside housing, the fare freeze and fairness. More though, we applaud the pace of your announcements and pledges on clean air since you were elected Mayor. Your commitment to action and protecting public health contrasts strongly with the incompetence and worse of Boris Johnson who bought us 1,000 ‘vanity buses’, championed ‘car is king’ policies and we found guilty of public health fraud on an industrial scale for spraying pollution suppressants (so called ‘glue’) in front of the air pollution monitors most-used to report legal breaches and warn of smog episodes before the London 2012 Olympics. The pace and content of your public announcements is already doing much to build public understanding of the dangers of air pollution and give people advice on protecting themselves and reducing pollution for themselves and others e.g. near schools. the general population when air pollution is expected to be MODERATE for two or more consecutive days or HIGH or VERY HIGH for one or more days. Early warnings must also be issued for the general population when an ‘EU Information threshold’ for ozone could be breached (on a Defra or LAQN monitor in London) which can happen during one day of MODERATE*. * The Government covered-up such a breach last week. It is important that warnings are issued when several not all monitors are likely to report exceedances. Please note that Met Office forecasts, currently used by the Government and the BBC, exclude urban roadsides and so are inadequate. We recommend air pollution forecasts by King’s College London. Regular warnings are needed also for everyone who lives in, works in or regularly visits a place where air pollution exceeds the World Health Organisation (WHO) guideline for annual mean exposure i.e. long-term exposure to air pollution as opposed to short-term exposure during episodes or peaks. Please therefore develop an ‘air pollution episode’ plan (e.g. like a ‘heat wave’ or ‘cold weather’ plan) and wider public health communications (e.g. similar to those warning people about smoking or the dangers of alcohol). Your predecessor did more to cover-up air pollution than warn people about it during his eight years in office. 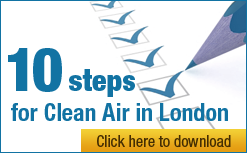 Please ensure that London’s existing air pollution monitoring network is maintained and enhanced. Otherwise, it risks becoming obsolete or increasingly unreliable e.g. Oxford Street earlier this year. The so-called ULEZ is nothing of the sort. When it was initially described by Boris Johnson it would have allowed only the cleanest vehicles to enter the central congestion charging zone. After a succession of backward steps by Mayor Johnson, the ULEZ became little more than a ‘money maker’ to be implemented by you or your successor in September 2020. The simple fact is that it is mathematically impossible for London to comply with WHO guidelines for nitrogen dioxide (NO2) until 2025 or beyond unless all diesel vehicles are banned from the most-polluted places. Any date beyond 2020 is totally unacceptable so bans are necessary. Even that date would be 10 years after legally binding limits were required to be met and eight years after diesel exhaust was classified as carcinogenic for humans. it may not be implemented until September 2020. Central congestion charging zone (CCZ): ban pre-Euro 6 diesel vehicles and pre-Euro 4 petrol vehicles from the central congestion charging area (and apply the ‘T-Charge’ for newer diesel vehicles) by 1 January 2018. Please reinstate the western extension of the CCZ by 1 January 2018. Ban all diesel vehicles in these areas by 1 January 2020. Elsewhere within the LEZ: progressively tighten standards for larger then smaller diesel and petrol vehicles by 1 January 2018, 1 January 2020 and 1 January 2022. Ban all combustion vehicles from London by 1 January 2024 at the latest. Smaller ULEZs are also needed at hotspots e.g. around Heathrow and in east London. “I will consult on bringing forward the Ultra-Low Emission Zone and expanding it along major arterial routes or a wider section of central London.” CAL emphasis. In CAL’s opinion this means a bigger ULEZ sooner than Boris Johnson planned in September 2020. We have given you zero points for your proposal because CAL has received no assurances, despite seeking them, that you will make the ULEZ bigger sooner than September 2020. In CAL’s opinion it would be totally unacceptable to delay the implementation of the bigger ULEZ beyond 1 January 2020 i.e. beyond this Mayoral term. CAL supports the implementation of your proposed T-Charge in 2017 for diesel vehicles to reduce air pollution. However, we want to see it combined with bans as described above so that charging applies to all newer diesel vehicles entering the CCZ from 2017. CAL takes it for granted that you will tighten bus emission standards rapidly. We urge you when doing so to retrofit the current bus fleet to the maximum extent technically feasible (i.e. to save the cost of replacement) and purchase with immediate effect only buses that will operate in electric mode in the most polluted places. ban all diesel taxis and PHVs from London by 1 January 2020. This should be funded by a scrappage scheme for taxis only from transport scheme income e.g. the T-Charge. CAL supports bans and charging for petrol vehicles on the grounds of congestion rather than air pollution grounds until Euro 6 or tighter emission standards apply to diesel vehicles (when Euro 4 or better would be technology neutral for petrol vehicles). CAL considers that discounts for ‘residents’ should last no longer than two years and apply only in hardship cases. CAL considers that you must simplify the myriad emission schemes that will operate in London. In this Mayoral term we will have the congestion charging zone, the ‘T-Charge’, the ULEZ (sooner, stronger and perhaps bigger) and additional measures for vehicles within the LEZ that are outside the north/south circular. CAL urges you to implement Emissions Based Road Charging (EBRC). In one scheme it would be possible to encompass all the above schemes in a cost neutral way. Such a scheme would be ‘smarter’ still if you can offset charging against vehicle excise duty (VED). We are pleased that you are proposing to bring forward the current ULEZ. Doing so scores one point but this is generous since it should be combined with diesel bans for older vehicles. London needs a ‘Clean Air Revolution’ that hammers diesel emissions and mobilises massive investment in active travel and public transport. The charging of newer diesel vehicles and scrapping of the congestion charge exemption for PHVs can provide ample funding. CAL also considers it essential that we separate people from pollution. Even when diesel and petrol emissions are eliminated, people will still be exposed to tyre and brake wear unless there is widespread pedestrianisation of public spaces. This must include Oxford Street, Parliament Square, the Embankment and at least one-third of the City of London. High streets and other busy streets, such as Exhibition Road, should be pedestrianised – initially with vehicle free areas and car-free days. Please dismiss ‘car is king’ or nimbyist opposition to such schemes. CAL applauds measures by you to offer a boiler scrappage scheme. However, you must go much further and create an integrated approach to air pollution, climate, energy, health and transport policy that stops the proliferation of new emission sources in the most polluted places e.g. there must be no new combined heat and power units or gas boilers for commercial or industrial use within the north/south circular. Please oppose all incinerators and biomass burning in London. a new Clean Air Act. This is much needed and should eliminate the use of fossil fuels in London. Please sponsor such an act through Parliament. joining ClientEarth’s legal case against the government for NO2. a diesel scrappage scheme funded by the government. Any such scheme would need to be targeted on those most needing it and ensuring a switch to cleaner alternatives e.g. car clubs. Last but not least, CAL is very concerned that the Government is mercilessly and myopically still pursuing policies that they know will kill people. A current example is the ‘Heat networks investment project’ that will encourage biomass burning and incinerators in cities at a £300 million cost due to air pollution i.e. deaths and/or illness. Please oppose such policies in London. In conclusion, CAL is impressed by your commitment and pace of action to achieve clean air in London. However, CAL is concerned that you are still not grasping the scale and urgency of action needed to protect public health after eight years of inaction and cover-up by Boris Johnson. Deadlines cannot be delayed just because an incompetent predecessor took no action. CAL urges you to upscale your ambitions significantly – please go much further much faster – so that we see a ‘Clean Air Revolution’ that bans diesel as we banned coal so successfully 60 years ago and implements all the other necessary measures to protect public health and mitigate climate change. By doing so, London will be a world leader again. I would welcome the opportunity to discuss this submission with you or your officials.